Whether you are suffering from back issues (sciatica, scoliosis, or lower back pain), joint pain (rheumatoid arthritis, osteoarthritis) or injuries resulting from athletic activity (plantar fasciitis, tendonitis, knee pain), JOI has 10 physical therapy clinics conveniently located in Jacksonville and Northeast FL who specialize in orthopedic rehab. 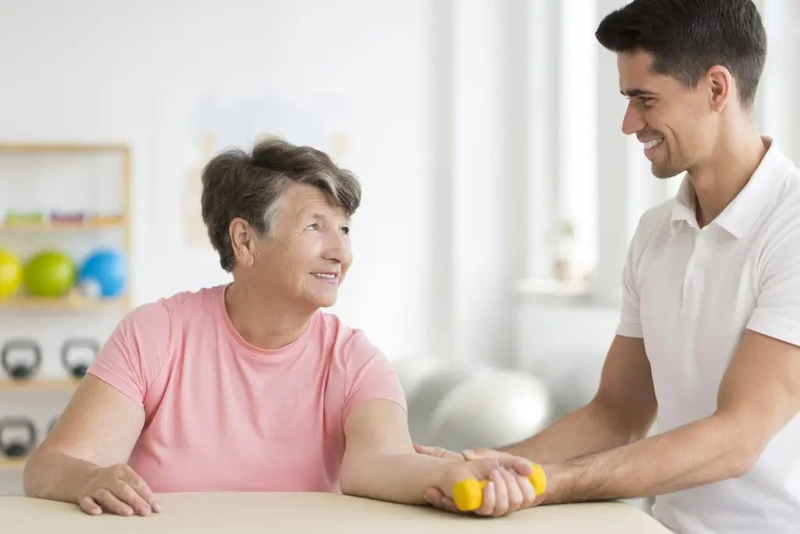 Additionally, if you are looking to get the independence you had before your injury, we offer Occupational Therapy through one of our fully licensed Occupational Therapists (OT). Our OT’s work in conjunction with our Physical Therapists to help our patients not only recover from their injuries, but return to the daily activities they are used to performing. Most of our OT’s are also Certified Hand Therapists (CHT) who specialize in evaluating and treating injuries and conditions of the upper extremity (shoulder, arm, elbow, forearm, wrist, and hand). The JOI Rehab University/Arlington location is moving on Mid January to Monument Road. JOI Rehab Arlington clinic offers Physical Therapy, Occupational Therapy, Hand Therapy, Sports Rehab, DME or Bracing, Graston Therapy, KT Taping and Return to Sport Services. We work closely with your JOI Physician but we also work with any physician who prescribes one of our services. Our goal is to return you to your prior level of function with good customer service. The JOI Rehab Beaches location is one of the largest Physical and Occupation Therapy Centers in the NorthEast Florida Region. It is on the Baptist Beaches Campus next to the Baptist Outpatients Surgery Center. JOI Rehab Beaches offers Physical Therapy, Occupational Therapy, Hand Therapy, Massage Therapy, Sports Rehab, DME or Bracing, Laser Therapy, Graston Therapy, KT Taping and Return to Sport Services. We work closely with your JOI Physician but we also work with any physician who prescribes one of our services. Our goal is to return you to your prior level of function with good customer service. The JOI Rehab Fleming location is one of the largest Physical and Occupation Therapy Centers in Fleming Island. It is on the Baptist Fleming/Clay County Campus. JOI Rehab Fleming offers Physical Therapy, Occupational Therapy, Hand Therapy, Massage Therapy, Sports Rehab, DME or Bracing, Graston Therapy, KT Taping and Return to Sport Services. We work closely with your JOI Physician but we also work with any physician who prescribes one of our services. Our goal is to return you to your prior level of function with good customer service. The JOI Rehab Mandarin location is one of the largest Physical and Occupation Therapy Centers in Mandarin. It is located on San Jose Blvd. across the street from the Care Spot. JOI Rehab Mandarin offers Physical Therapy, Occupational Therapy, Hand Therapy, Sports Rehab, DME or Bracing, Graston Therapy, KT Taping and Return to Sport Services. We work closely with your JOI Physician but we also work with any physician who prescribes one of our services. Our goal is to return you to your prior level of function with good customer service. The JOI Rehab Nassau location is located on the Baptist Nassau Campus. JOI Rehab Nassau clinic offers Physical Therapy, Occupational Therapy, Hand Therapy, Sports Rehab, DME or Bracing, Graston Therapy, KT Taping and Return to Sport Services. We work closely with your JOI Physician but we also work with any physician who prescribes one of our services. Our goal is to return you to your prior level of function with good customer service. The JOI Rehab North location is located near the Rivercity Marketplace Mall. JOI Rehab North clinic offers Physical Therapy, Occupational Therapy, Hand Therapy, Sports Rehab, DME or Bracing, Graston Therapy, KT Taping and Return to Sport Services. We work closely with your JOI Physician but we also work with any physician who prescribes one of our services. Our goal is to return you to your prior level of function with good customer service. The JOI Rehab Point Meadows location is located off Gate Parkway by the new IKEA. JOI Rehab Point Meadows clinic offers Physical Therapy, Sports Rehab, DME or Bracing, Graston Therapy, KT Taping and Return to Sport Services. We work closely with your JOI Physician but we also work with any physician who prescribes one of our services. Our goal is to return you to your prior level of function with good customer service. The JOI Rehab San Marco location is the largest Physical and Occupation Therapy Center in the NorthEast Florida Region. It is on the Baptist Downtown Campus in the Reid Medical Building. JOI Rehab San Marco offers Physical Therapy, Occupational Therapy, Hand Therapy, Massage Therapy, Acupuncture, Sports Rehab, DME or Bracing, Laser Therapy, Graston Therapy, KT Taping and Return to Sport Services at our new Sport Center. We work closely with your JOI Physician but we also work with any physician who prescribes one of our services. Our goal is to return you to your prior level of function with good customer service. Saturday 7:30AM-11:30AM First three Saturdays the month (unless Holiday), call for more information. The JOI Rehab South location is located at the intersection of Old St Augustine Road and Philips Hwy. JOI Rehab South clinic offers Physical Therapy, Occupational Therapy, Hand Therapy, Sports Rehab, Massage, Laser Therapy, Acupuncture, DME or Bracing, Graston Therapy, KT Taping and Return to Sport Services. We work closely with your JOI Physician but we also work with any physician who prescribes one of our services. Our goal is to return you to your prior level of function with good customer service. The JOI Rehab Westside location is located on Roosevelt Blvd. in the Ortega area of Jacksonville. JOI Rehab Westside clinic offers Physical Therapy, Occupational Therapy, Hand Therapy, Sports Rehab, DME or Bracing, Graston Therapy, KT Taping and Return to Sport Services. We work closely with your JOI Physician but we also work with any physician who prescribes one of our services. Our goal is to return you to your prior level of function with good customer service.